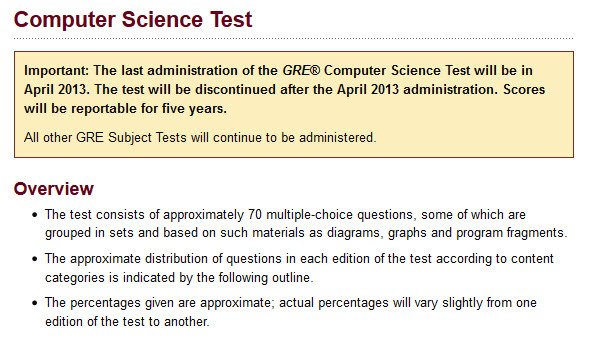 Important: The last administration of the GRE® Computer Science Test will be in April 2013. The test will be discontinued after the April 2013 administration. Scores will be reportable for five years. I have reached out to ETS to find the reason for discontinuation GRE Computer Science Subject Test. Because of drastically falling registrations, Educational Testing Service, which administers the GRE tests, has decided that the April 2000 test will be the last history subject test it will conduct. According to Kathy O’ Neill, director for the GRE subject tests, many of the GRE subject test volumes have been declining in the last few years, but the decreases for history and sociology have been larger than for the other tests. The decline in registration for the history test last fall was so large that it triggered the decision to discontinue because there were too few examinees to be able to perform the necessary statistical analyses. More than 1,800 students took the test in the l995–96 academic year, but last year’s volume was only 560 (for all test dates combined). O’ Neill stated that when fall 1998 registrations showed that the volume for this year would be even lower, it was clear to the ETS decisionmakers that the statistical equating calculations that were necessary to sustain the history test could no longer be performed accurately. My guess it that low volume of students taking Computer Science Subject test compared to the cost involved in administering the test could be the reason for GRE Computer Science subject test discontinuation. Nope.It wont be India and it is a big blow to people who were expecting to bank on Subject GRE scores to offset their poor grades. The nearest places are Kathmandu and Colombo.I have booked my Subject GRE slot for April 20 at Colombo Centre. It simply means that there won’t be a GRE CS test after this April. It might be a good news for people who have good academic stats while not so for people who have not so good academics or people trying to migrate to CS from other disciplines. when in April are will they discontinued the computer science test in April? Its a very bad news for those who have low acads and were planning to support it with subject GRE score.Its last administration is not available in india. Correct me if i am wrong. Its a very bad news for those who have low acads and were planning to support it with subject GRE score.Its last administration is not available in india.Correct me if i am wrong. What does this mean can any one elaborate it please.